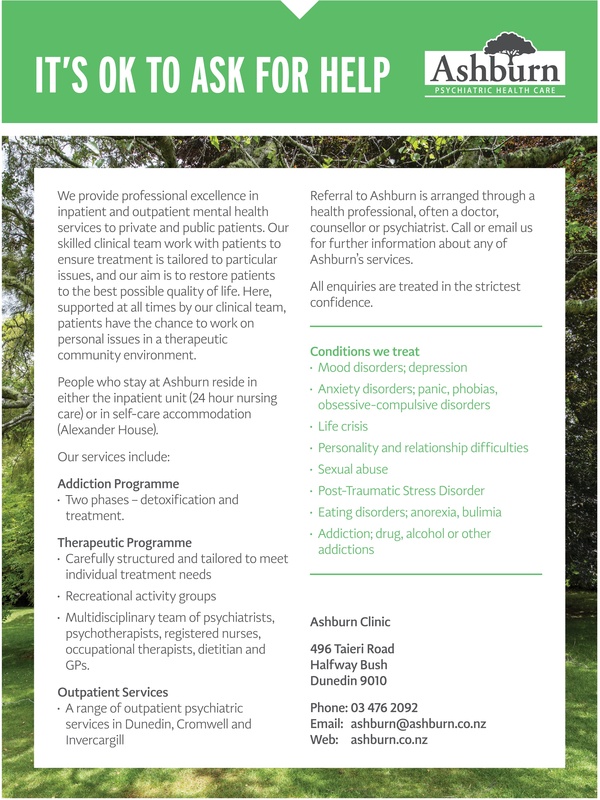 Ashburn Clinic is New Zealand’s oldest private psychiatric hospital, and one of the oldest therapeutic communities. Situated at the top of Three Mile Hill, it was founded in 1882 as an alternative to the public services, and in the early 20th century it gained a strong reputation as a treatment centre for a variety of psychiatric illnesses. In the second half of the 20th century the hospital achieved national and international recognition as a therapeutic community. Patients came from all over New Zealand, and from a wide range of socioeconomic groups. Health restructuring and changes to funding threatened to close the hospital in the 1980s and 1990s, but staff persevered and a reinvigorated hospital emerged establishing the current combination of private and public-funded admissions. The ownership of the Clinic was consolidated into the Ashburn Hall Charitable Trust in 2001, and it was formally reopened by the Minister of Health, Annette King, as Ashburn Clinic. Now, Ashburn offers a range of services to all New Zealanders. It works closely with the Ministry of Health and ACC to provide assessment and treatment, and with GPs and other healthcare professionals here in Dunedin and throughout New Zealand. Our patients are actively involved in their own and each other’s recovery, taking part in the daily running of the hospital, and social and recreational activities, alongside staff. They also help and support each other in the challenges of living and working within a therapeutic community. The community fosters an atmosphere of open communication, and the traditional hospital hierarchy is more relaxed so we can build a more democratic and open style of relating between staff and patients. The main therapeutic programme utilises a structured day, with an emphasis on group meetings of various kinds. By living in the community with others whom often have had similar experiences, people are able to express and explore the issues that bring them into treatment. The group provides a safe place for learning and understanding whilst also allowing people to experiment with different ways of managing their distress and anxiety. The Ashburn community of patients and staff together work to try and better understand the meaning of each person’s feelings, actions and relationships, thus facilitating understanding and opportunities to change. Severe and complex responses to trauma. Residential services involve the patient residing at Ashburn, in either our inpatient unit or Alexander House, our self-care accommodation. The inpatient unit offers 24-hour nursing care and clinical support, and is where most patients are initially admitted for assessment and to start their treatment. Patients may move on to Alexander House for ongoing treatment which involves full access to the therapeutic community programme. In both units patients have their own bedroom, and meals are provided. Outpatient services provide psychiatric services at Ashburn, and also via monthly clinics in both Invercargill and Central Otago. In order to be considered for our services you will need to be aged 17 or over, and referred by a healthcare professional. Access to Ashburn’s services differs depending on how the treatment is funded (either private or public funding). Talk to your GP or healthcare professional in the first instance, visit our website, or call us for guidance.